Son Wan Ho wins his second Hong Kong Open title and confirms his spot in the World Tour Finals. It had been 4 years since Son Wan Ho (pictured) won his last Hong Kong Open title. 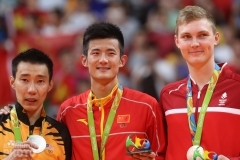 At the time, it was his second career Superseries title and his second win over then-World Champion Chen Long so it looked like a real turning point in his career. But in 2015, he reached only one international final, at the Gwangju Universiade, and was upset but a young compatriot. In 2016, Son reached 3 Superseries finals but came away as the runner-up each time and the Korea Masters that year was his only title…between his twin Hong Kong successes! 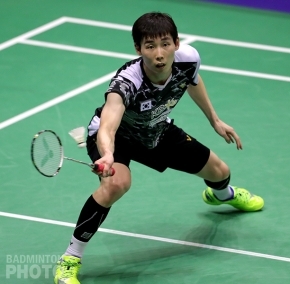 Today in Hong Kong, Son Wan Ho came out firing against Japan’s Kenta Nishimoto. He looked fresh and confident after his impressive semi-final win over the reigning World Champion and raced out to a 10-2 lead. Then things turned very sour very quickly for the Korean as Nishimoto stepped up his attack and Son made error after error. A run of 12 straight points completely changed the complexion of the game and Nishimoto rode the momentum until he had the first game 21-14. Son had a good start to the second and third games and the forlorn body language he displayed late in the opener never returned. He kept calm and patient and he was never afraid to lift to Nishimoto’s smash nor to send backhand drops to the net area even with his opponent encroaching. The scores remained close until finally Son was able to open up a lead after the interval in the decider. Kenta Nishimoto (pictured) was obviously fatigued but Son remained patient and refused to attack on half chances, preferring to continue moving his opponent from corner to corner until he had the rally won. By the time the last shuttle hit the floor, Son had the title and also a confirmed ticket to Guangzhou. Nishimoto still has a very good chance of being the 8th qualifier for the season-ending World Tour Finals but he will lose his position if Sameer Verma wins the India Super 300 title next weekend. 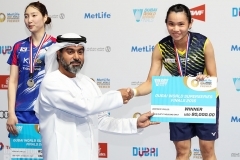 The only upset on finals day in Hong Kong came when Japan’s Yuta Watanabe / Arisa Higashino (pictured) won in straight games over Wang Yilyu / Huang Dongping of China. 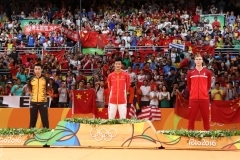 Wang and Huang had been runners-up at 3 Super 750 events and at the World Championships, each time to their world #1 compatriots but they were unable to take advantage of the opportunity in Hong Kong. The Japanese pair played quick and smart and Higashino had completely shut down the net area by the end of the second game. It was the 6th time they’d faced Wang/Huang this year and it was their first victory. The loss means that the Chinese world #2 are still without a title in the BWF World Tour and the World Tour Finals in Guangzhou will be their last chance. The mixed doubles title was the last of 3 for Japan on the day. Starting out the afternoon were world #1 Yuki Fukushima / Sayaka Hirota (pictured), who denied Korea’s Lee So Hee / Shin Seung Chan a second straight winning weekend. The Koreans attacked and defended impressively but made repeated errors in the frontcourt while their opponents maintained their consistency and kept creating opportunities. 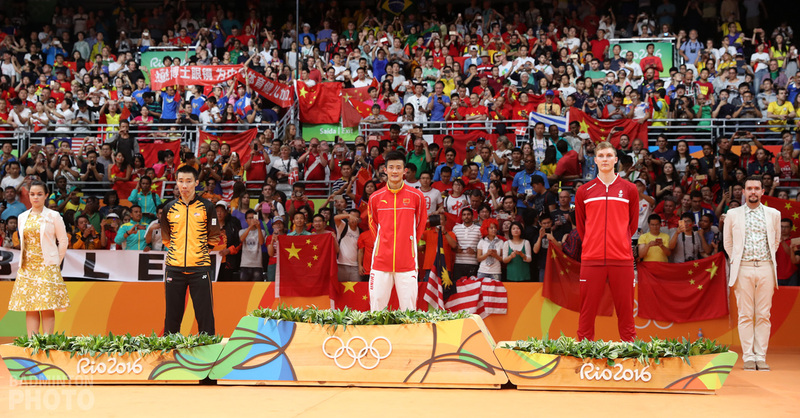 Unfortunately for the top seeds, they will not likely be able to cap off their season, when they won 4 World Tour titles, with a win in Guangzhou. 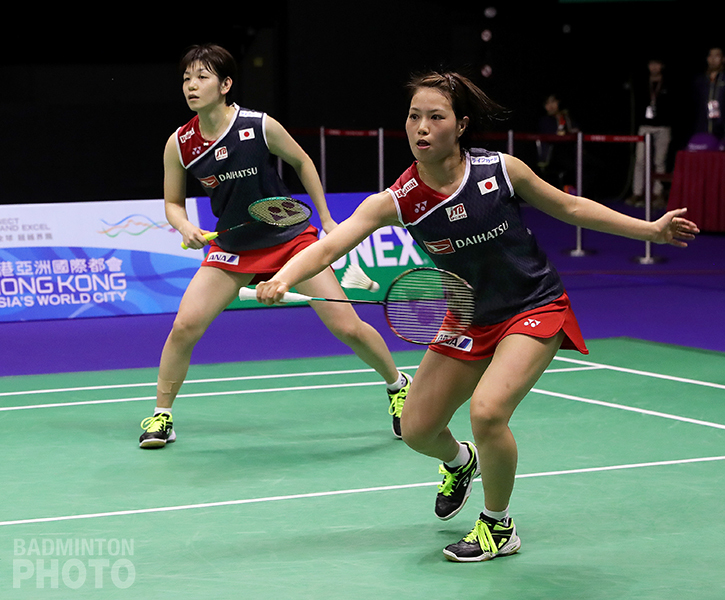 Their compatriots Matsutomo/Takahashi are slated to play in India, where merely stepping on court for their opening match will give them enough points to qualify for the Finals alongside Matsumoto/Nagahara who qualified automatically as World Champions. The Japanese fortunes continued into the second match as Nozomi Okuhara (pictured bottom) won the battle of former World Champions. 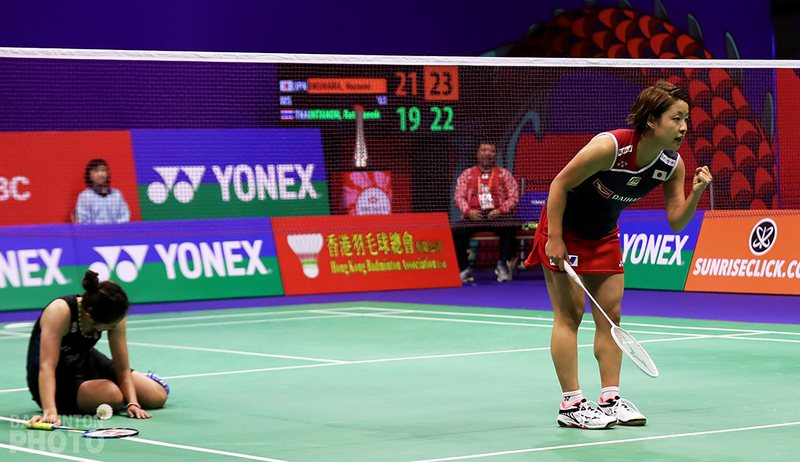 She won in straight games against Ratchanok Intanon of Thailand. 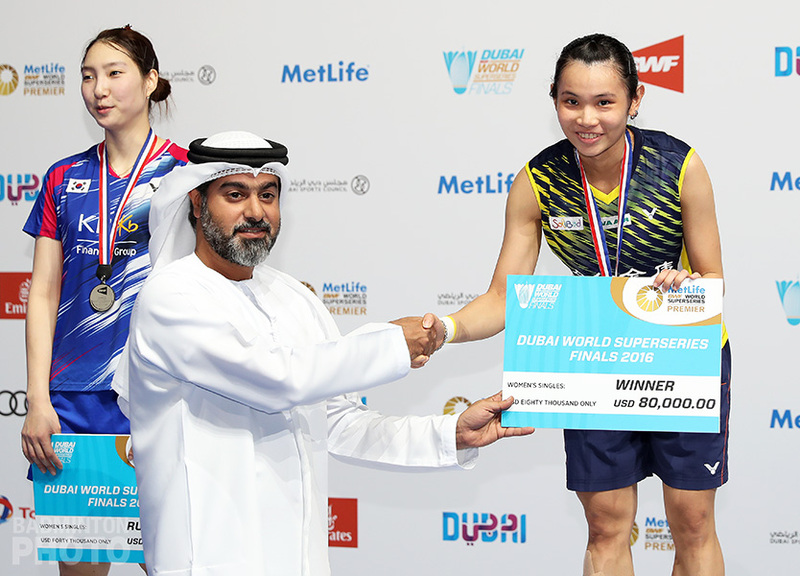 It was Okuhara’s 3rd title of the year, as she had already taken Super 500 titles in Thailand and Korea. In the last match of the day, Japan’s Takeshi Kamura and Keigo Sonoda failed to win back the title that had become theirs in 2016. 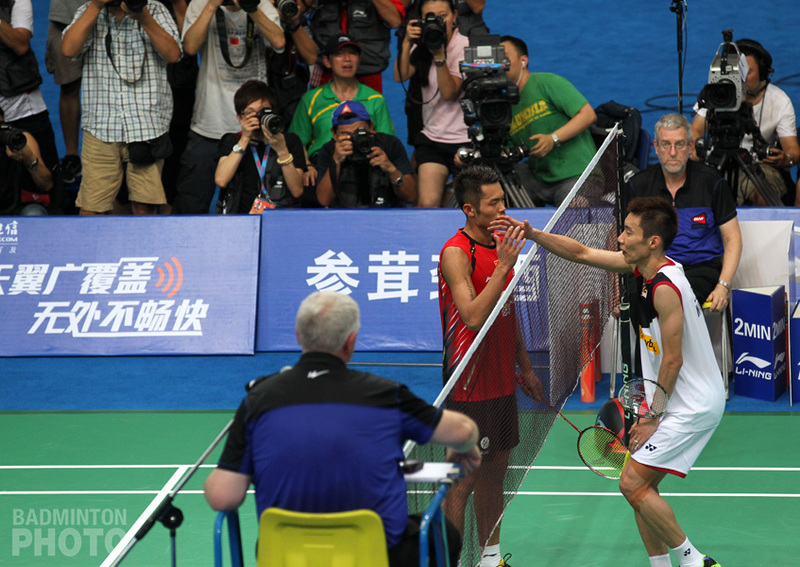 Unlike Fukushima/Hirota, the men’s doubles world #3 could have confirmed a spot in Guangzhou with a victory. Like the ladies, however, they finished the week in the top 8 in the World Tour standings but stand to be ousted early in the coming week, as soon as the #7 and #8 pairs step on court in India. Of course, there is no shame in being beaten by the in-form top seeds. Marcus Fernaldi Gideon / Kevin Sanjaya Sukamuljo (pictured) showed a dominance that eluded them in the earlier rounds and they ran away with both games to take their 3rd straight win over the pair that had bounced them out of the Worlds this past summer. It is the 8th title of the year on the BWF World Tour for the Indonesians, who also happened to score an Asian Games gold medal this year. Most of the Hong Kong finalists will return home to await invitations to the World Tour Finals but the Koreans and Ratchanok Intanon are still slated to play the Korea Masters at the end of this month. Yuta Watanabe is the sole shuttler who is scheduled to play in India in the coming week, where starting just one match will be enough to make him the only Guangzhou qualifier in two different disciplines. well, just because you don’t read long articles doesn’t mean others won’t. I like to read articles from this site and find myself always coming back for more. The articles are well-written and not biased towards any player/country. i am reading the whole article. and i always wait for new articles from badzine. Keep up the goodworks. Nobody is really reading these long articles, NOBODY! We only care for singles events!! That’s reality. Make it shorter please. Pierre you don’t know abt Badmintin so stp!